Dear Readers, last week I wrote about how my friend J and I visited the water lilies and lotuses at Kew Gardens, and all the interesting things that we found out about them. 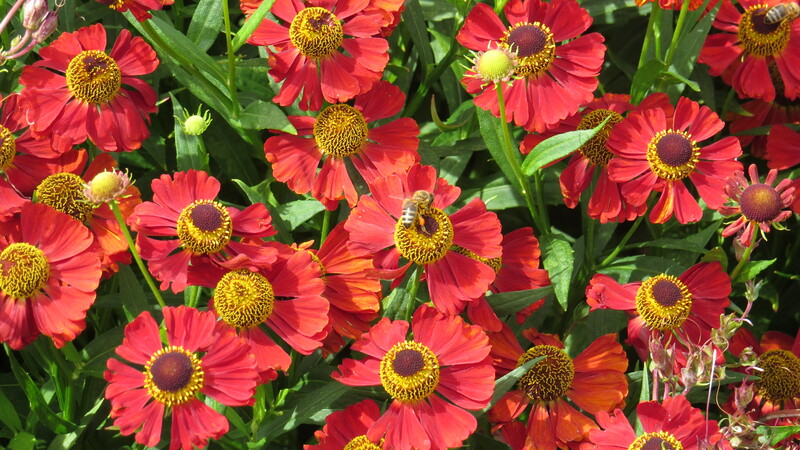 But the other big theme of the visit was pollinators, and bees in particular. August can be a tricky month in the garden – all the spring flowers are long gone, and everything can be looking a bit tired. What plants are the bees and hoverflies and butterflies using now? At Kew there is one magnificent border called the Great Broad Walk Border, which at 320 metres is the longest double herbaceous border in the world. Great drifts and swathes of flowers stretch on both sides of the path, in shades of yellow and orange, pink and purple, blue and white. Who could resist a slow meander along this magical road? Certainly not Jo and I, and as a result I ended up with mild sunburn, but it was a small price to pay. What impressed me most about this array of plants was that every single one had some wildlife value. 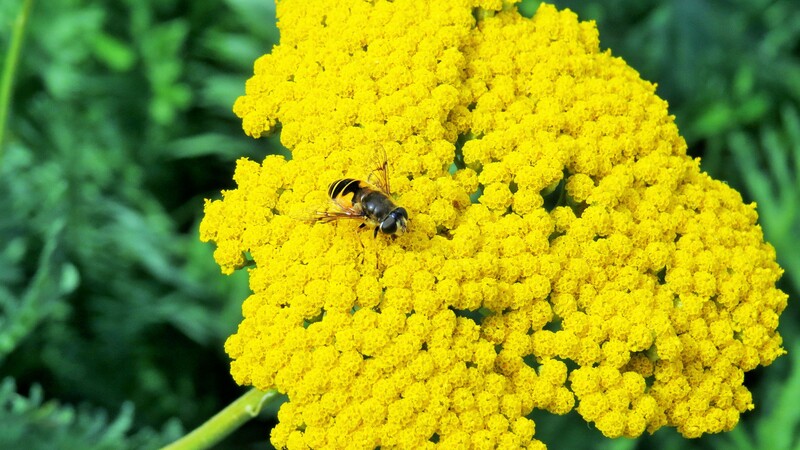 There was bright yellow Achillea, a close relative of the humble yarrow, which was swarming with hoverflies – the flat ‘platforms’ of the flowerheads, which contain hundreds of individual flowers, are attractive to flies and beetles who do not have the specialised knowledge and mouthparts to deal with the bells and cups and tubes of other plants. Bronze fennel was another favourite with these humble pollinators, again because its nectar and pollen are easily accessed. 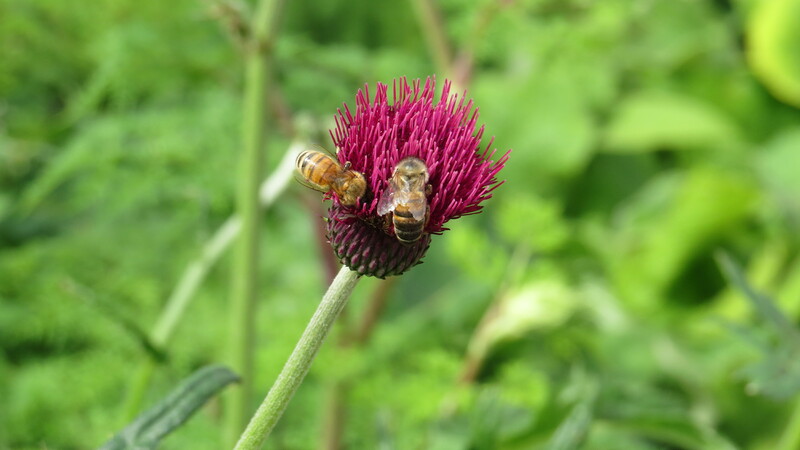 There seems to be a trade-off between ease of access and quality and quantity of food, however: the more difficult a plant is to pollinate, the better the reward for the pollinator has to be. 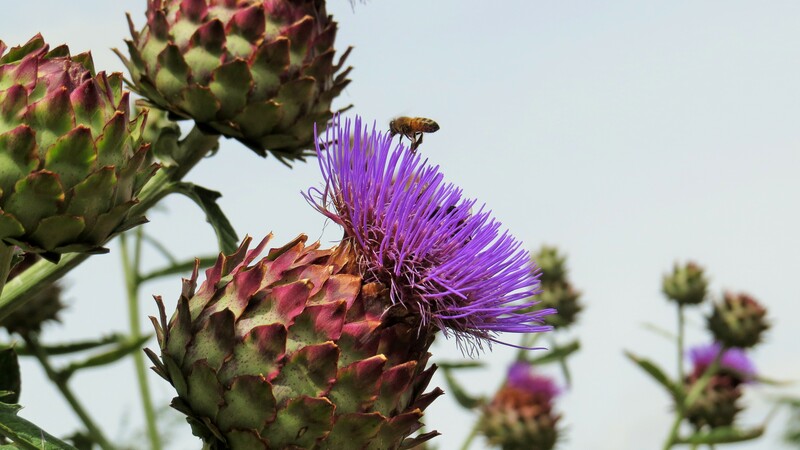 The huge purple flowers of globe artichokes were also favourites, particularly with bumblebees, who can force their way between the tightly-bunched petals to get to the nectar. I always forget that these vegetables are members of the thistle family, at least until I look at them close up and realise that the part that we eat is the seedhead of the plant. 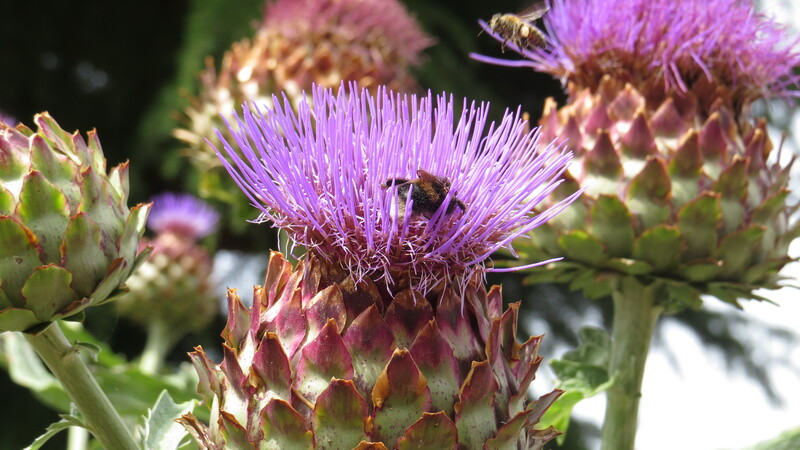 I am trying to grow a globe artichoke in my garden, but I fear that the spot is not sunny enough – thistles of all kinds do like a blast of sunshine. There were also some of my favourite thistles, a variety called Cirsium atropurpureum, which I used to have in the garden but has now faded away. The bees used to be found in the middle of the flowers in a kind of nectar swoon, and they were doing the same here. I wonder if there is some benefit to the plant in having the bumblebees stay for an extended period? On balance, I suspect that they would rather that the bees did their stuff and moved on, but who knows. Prairie plants of all kinds have become very popular over the past few years, and with good reason. The huge cushions of pollen in Echinacea and Rudbeckia attract honey and bumblebees, and there are some lovely single chrysanthemums and asters. 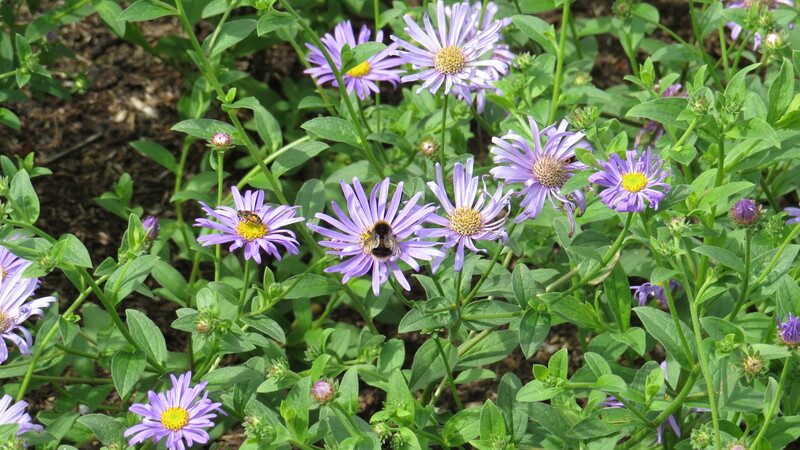 I am particularly fond of asters – they can provide food for bees right into the autumn, when everything else has had enough, and their delicate star-like flowers are striking counterpoints to the changing foliage around them. And finally, let’s not forget the benefits of Salvia of all kinds. Bees just seem to love it. 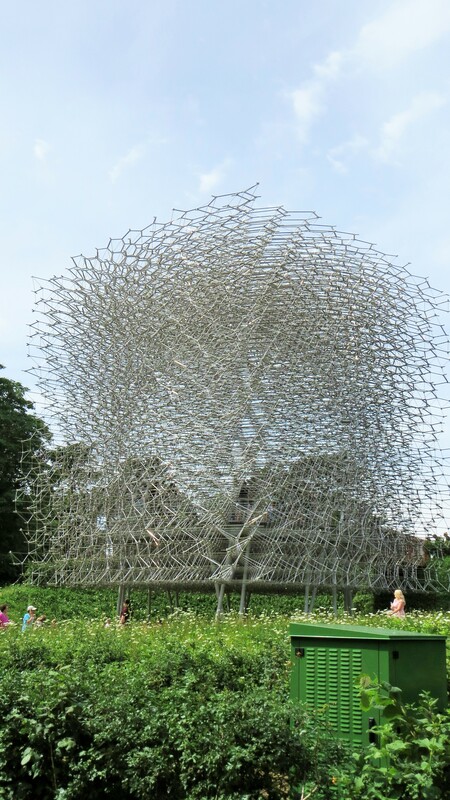 So, it seems as if Kew is taking bees seriously, and nowhere more so than in an installation that combines art and science, called ‘Hive’. 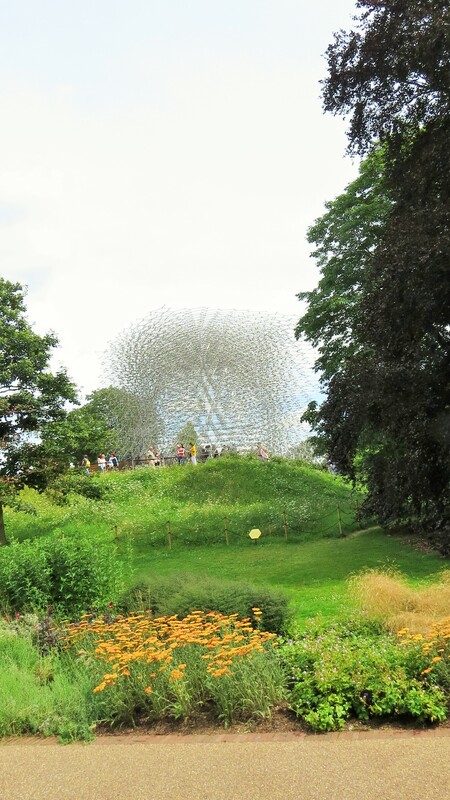 From a distance, Hive looks like a mesh of silver metal, floating like a cloud or swarm above a small hill. 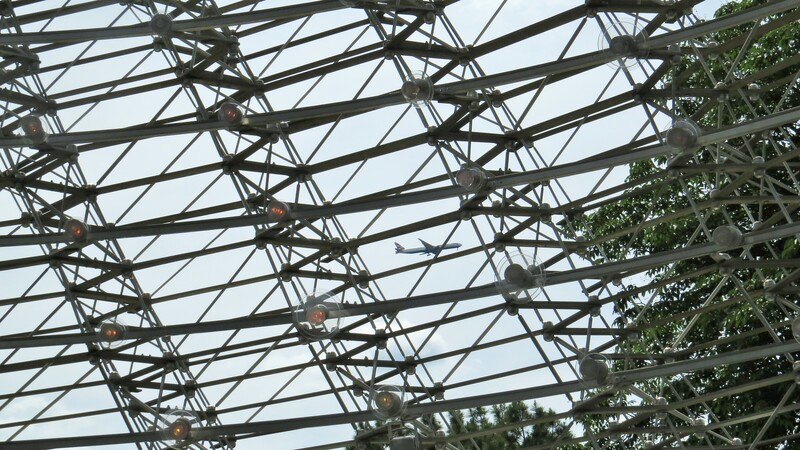 Close up, it becomes apparent that it’s a lattice of aluminium tubes, and as you walk into it you can hear the whole thing vibrating with a low hum. Lights inside the structure glow and subside, seemingly at random. But actually, the whole installation is wired up to a real bee hive behind the scenes, and the sound and lights are reacting to the levels of activity in the hive. On a hot day, the metal thrums busily as bees come and go, waggle-dance and feed their young. On a cold, wet day, I imagine that it is much more subdued. At the bottom of the installation there are listening posts. You are instructed to take a wooden stick from the top of the post, put one end of the stick between your teeth and the other into a slot on the post, cover your ears, and listen. You can hear a commentary explaining what the sounds that you hear are: in one, it’s two queen bees threatening one another, a kind of low vibration mixed with clicks and quacks. It is well worth doing this, and then standing back and watching full-grown men and women with sticks between their teeth listening to something inaudible to everyone else. It feels a little like Candid Camera (for those of you old enough to remember it). 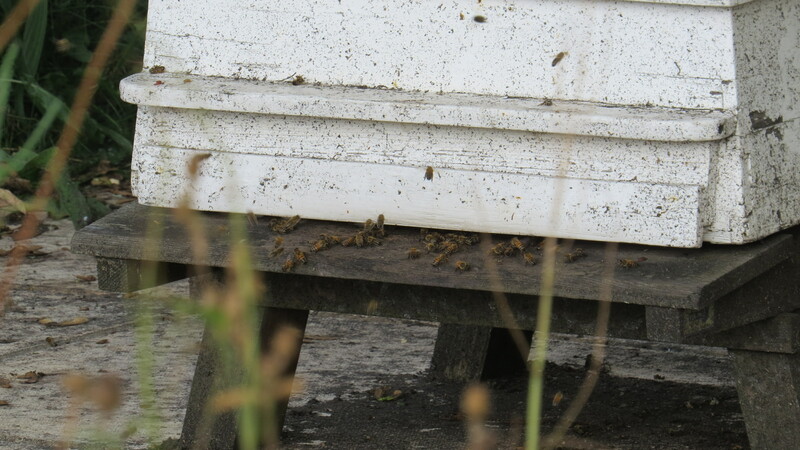 And of course, we wanted to go in search of real bee hives. The one that is linked to the installation is hidden away behind the scenes, but in the student garden, which is tucked away in a corner, there is a working hive. This is safely fenced off to prevent any unwanted human/bee interactions, but it’s close enough to see the bees waiting on the launch pad, perhaps to determine from the other bees where the best nectar is. 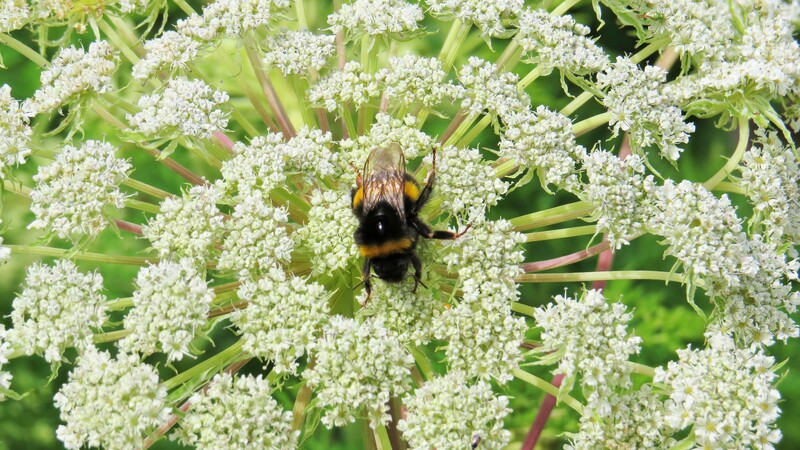 It’s known that many bees will be ‘loyal’ to a particular patch of plants until they are all finished: after all, it makes much more sense for bees to continue to visit a known site with plenty of food than to be forever looking for new ‘spoils’. 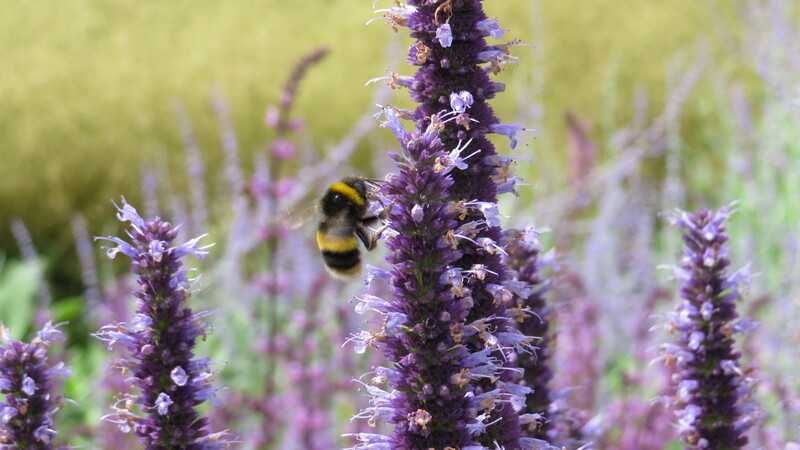 Bumblebees in particular are extremely efficient at working out the best combination of route, distance and nectar availability to maximise the amount of food that they bring back. So, it seems that Kew is certainly doing its best for pollinators of all kinds, and I for one am delighted. Astute choice of plants can make all the difference between a garden that is lifeless, and one that is full of bees and butterflies. It’s great to see a world-renowned garden such as Kew taking this on board in such a whole-hearted way. I salute them. All photos copyright Vivienne Palmer. Free to use and share non-commercially but please attribute and link back to the blog, thank you! 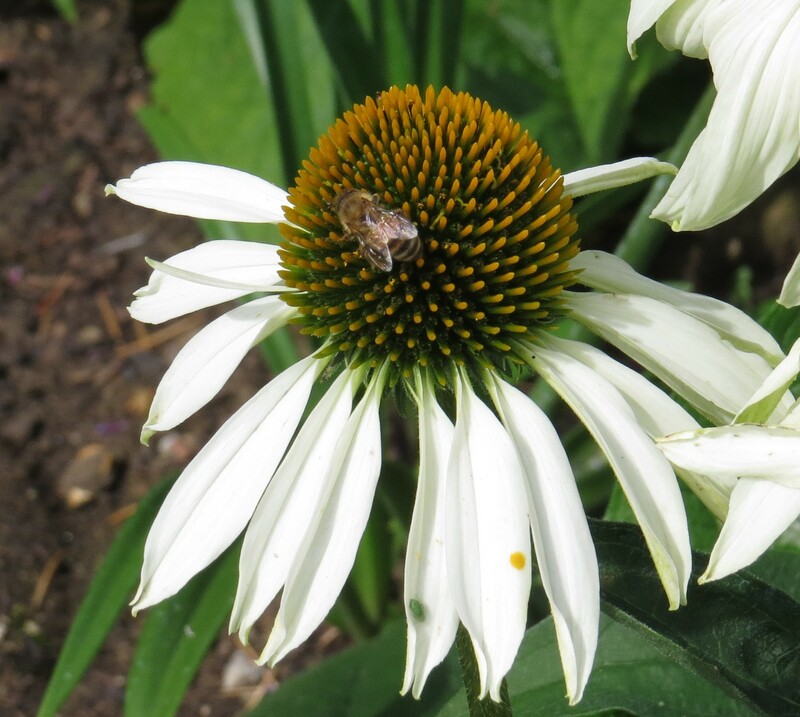 This entry was posted in Bugwoman on Location, London Invertebrates, London Places, London Plants on August 20, 2016 by Bug Woman. Bravo for Kew Gardens!!! Really wonderful that such a well known, public space would assist and honor the bees. I know! I was very impressed. I must visit more often…. I haven’t been there for 50 years, it was just before I married at the age of 19! I have Marjoram in my garden and that is a total bee-magnet. Lovely images, thank you.